Chancellor George Osborne has launched the National Infrastructure Commission to oversee £100bn of spending on infrastructure projects. The money, which had already been announced, will be spent by 2020 on "vital projects" such road, rail and flood defence improvements. The Commission will be led by former transport secretary Lord Adonis. "This is about jobs, growth, living standards and ensuring Britain is fit for the future," Mr Osborne said. At the launch, in York Railway Museum, he added: "I don't want the time when we built the greatest infrastructure in the world to be a footnote in the history books. And that is what the national infrastructure commission is all about. "It's a statement from our generation that says: we are going to think for the long term, we are going to plan for the future, we are going to lead the world. "Now we haven't done enough of that in our country in the past." Lord Adonis, a Labour-appointed peer, and a former policy advisor to Tony Blair, was recruited by George Osborne. He resigned the party whip to head the new commission, and now sits as a cross-bench peer. The chancellor made the announcement at the National Railway Museum in York. The Commission will focus on three particular areas - connections between cities in the North, London's transport system, and energy. It is charged with producing a report at the beginning of each Parliament providing recommendations for spending on infrastructure projects. There will be seven Commissioners, including Lord Adonis. The others are former deputy prime minister Lord Heseltine; former member of the Bank of England's rate-setting Monetary Policy Committee Prof Tim Besley; former chair of the Olympic Delivery Authority Sir John Armitt; neuroscientist Sadie Morgan; former chief economist to the Greater London Authority Bridget Roswell; and chairman of the Victoria & Albert Museum Sir Paul Ruddock. However John McDonnell, Labour's shadow Chancellor, said the project would detract from efforts to create an economic hub in the north of England. "We welcome the setting up of the National Infrastructure Commission as it is a Labour policy, it is just sad that it is not being properly funded. The chancellor seems to be selling off national assets to fund this commission because he has decided to limit his options with his economically discredited austerity agenda. "When his failure on infrastructure investment is combined with the lack of support for the steel industry, and the cuts to tax credits, it means that George Osborne has pulled the plug on the Northern Powerhouse before he has been able to put it together." In December last year, the government announced plans to spend £2.3bn on flood defences and £15bn on road improvements, as well as new proposals on housing. 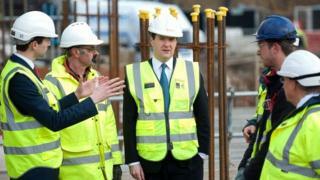 The government first announced plans for £100bn of infrastructure spending in the summer of 2013. At the time, it said the UK had "for centuries been pioneers in infrastructure". In recent decades, it said, "we have let this proud record slip".